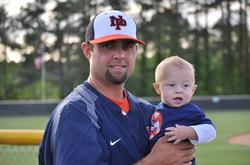 Brief Bio: Coach Meadows is entering his 15th year as the head varsity baseball coach of the North Pitt Panthers. The Diamond Panthers have won two conference championships and three Easter Tournament Championships under his tenure. His teams have also made the State Playoffs in 12 of the 14 years, and compiled 245 total wins over the 15-year span. The Diamond Panthers have sent 16 players to the collegiate level in his time span, and had 11 players achieve “All-State” recognition. Meadows also coached Cross-Country for the Panthers, winning 3 consecutive conference championships from 2006-2008. He has been selected as a coach for the NC State Games baseball team in Region One 12 years, including spending 2 summers as the head coach. He also coached in the East/West Senior All-Star game in 2011. In the summer of 2016, Coach Meadows took over as the Pitt County American Legion Post 39 head coach. His team went 23-7 and finished 5th in the state in their first season, followed by a 27-6 record with a 3rd place finish in the State Tournament in his second year. Meadows earned his under-graduate degree in Exercise and Sports Science from East Carolina University, in which he graduated at the top of his class. He also earned his Masters degree from ECU with a MAEd in Health Education. He currently live in Greenville, NC with his wife Stephanie, daughters Riley & Madison, and son Easton.